Our technological partners offer an extensive portfolio of software in the field of Application Delivery and Virtualization. In combination with our services this leads to an holistic consulting approach and a big advantage for our customers. Especially when it comes to making business processes more efficient, software solutions should focus on the reduction of operational costs and an increase of productivity while ensuring the competitiveness and user satisfaction. With our certified coonsultants, our long-term partners and the resulting solutions we are always prepared to react with lasting solutions that will sustain the challenges of tomorrow. Even with the efficient software procurement and the different aspects of licensing, we will not leave you alone: Contract periods, maintenance, updates and upgrades put an intelligent and foresighted Software Asset Management ahead in which we'll be happy to support you. As AppSense Platinum Partner we offer extensive know-how to meet your needs. With our certified employees we support you in all aspects of the AppSense product line. From server-based computing environments to virtual and physical desktops, AppSense Environment Manager ensures users always receive a consistent, predictable and personalized working experience. AppSense Environment Manager is the only enterprise solution that enables standardized desktop environments to be fully personalized without the need for cumbersome pro les or scripts. Whether a user environment is delivered through server-based computing, virtual or physical desktops or a combination of the above, it is essential that users receive only the applications they require and are unable to introduce unknown executables into the environment. The use of unauthorized software destabilizes user environments and makes it more di cult for IT teams to troubleshoot corrupt desktops. In a shared user environment such as server-based computing, those costs are exacerbated when the action of one user impacts many. Current methods for enforcing application usage are limited to complex scripts or high maintenance black and white lists. AppSense Insight is a virtual appliance with a web-based console that enables desktop administrators to gather and analyze information from user devices and interactions with agility and ease. Insight makes it easy to rationalize your end-user computing estate. Want to know how many endpoints are running Windows 8.1? It’s a single click. Want to know how many Laptop users vs desktop users you have? Simple. Want to know how many of your users use Laptops vs VDI? Easy. Adapt your desktop delivery strategy proactively and keep your projects on schedule and on budget. AppSense Insight makes it simple to discover which endpoints in your environment have been running for too long. Want to know who has not rebooted since that critical Security Patch was pushed out? Want to see which endpoints don’t have e ective power management strategies in place? It’s a few clicks away. User Data migration projects can be beset with problems. Migrating user data from old endpoints to new ones, or migrating users from le shares to Enterprise File Sync and Share Solutions like AppSense DataNow can be fraught a airs trying to ensure you have all the data a user needs. AppSense Insight makes this a far more straightforward a air - it can tell you where every non-executable le owned by a user is on an endpoint, allowing you to have the peace of mind that no data was in non-standard locations that was not backed up or migrated. Used with AppSense DesktopNow Plus you can use the results to power AppSense Environment Manager to automate that Data migration into AppSense DataNow..
AppSense DataNow enables simple, secure access, sync and sharing of your enterprise les, no matter where they live. DataNow’s unique approach does not require data migration or new storage. It makes existing storage locations like le servers and Microsoft SharePoint easily accessible from any device and keeps users’ les in sync at all times. DataNow puts IT teams in complete control over where les are stored and provides granular policy control over how data is accessed. DataNow is designed to integrate simply with existing IT infrastructure, avoiding the need to provision new storage, migrate data, or manage users in multiple places. Since it works with what you already have, deployment is simple and non-disruptive. AppSense Exchange is a community forum where everyone who is interested can sign up. It includes numerous Environment Manager templates for direct use in your infrastructure. Furthermore you can also leave your questions and suggestions regarding AppSense products. 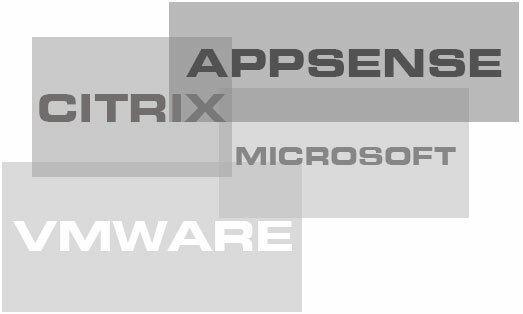 The Blog of Citrix CTP James Rankin covers many topics related to the AppSense products. As long-standing Citrix consultants we are already used to being confronted with the question of whether we could support Citrix. Many years ago, this question was definitely justified - however as Citrix has developed to a multi-product manufacturer, so we also have developed ourselves. We have come a long way together and from users or consultants we transitioned to a partnership. We are Citrix Solution Advisor and almost all of our consultants are Citrix certified specialists with different emphases. Today we are able to offer you network specialists with deep technical knowledge of the Citrix NetScaler and NetScaler Gateway products. Supplemented by various CCE-Vs , CCP-Vs and CCA-Vs focusing on XenApp, XenDesktop and XenServer. For the field of application migrations we can help you with AppDNA knowledge. Important information for all active Single Sign On users! As you may know, Citrix has stopped and retired the development of further versions of Single Sign On . The current versions of SSO 4.8 and 5.0 have an EOM of 2015 and an EOL of 2016. As an alternative you may have a look at the alternatives of Inprivata or Indigo Identityware. Please contact us with any questions in this regard on . This version offers Hybrid Cloud Provisioning for Amazon Web Services and Azure. Support for WOL on physical desktops in the enterprise via Microsoft System Center. You can get rid of Webinterface and build completely on StoreFront if you like. The environment can be controlled completely with Microsoft PowerShell. We have already implemented XenDesktop and know what is needed to get it up and running. We and our customers see us as experienced experts in the field of Remote Desktop Services and Virtual Desktop Infrastructures. For this reason our focus lies on the XenApp and XenDesktop products. Of course, we also offer expertise in all related technologies. Whether you want to build your environment in a private, hybrid or public cloud and on whatever hypervisor, we'll be happy to assist you. Instead of placing all of the user’s files on a network share like in the redirected files approach, FSLogix encapsulates the entire profile --including the registry-- in an in-guest container. As FSLogix Certified Partner we support you whether you ask for an Proof Of Concept or the integration into your existing infrastructure. Use our contact form and we contact you as soon as possible. Matrix42 = Empirum? Forget about it! The Matrix42 is part of the Asseco Group and it´s headquarter is located in Frankfurt am Main. The company supplies and manages future-oriented digital self-service workspaces that meet the needs of mobile workers. This is achieved through a comprehensive centralized and automated workspace management solution that enables secure access to workspaces in all physical, virtual and mobile environments. Matrix42 is known for Empirum. However, the view of Matrix42 in regards to the support of other software distribution products is changing - in this specific case to Microsoft System Center Configuration Manager. These products expand our product and solution portfolio in an intelligent way and confirm our expertise in the Microsoft System Center Configuration Manager environment. 30 Tage kostenfrei testen! Get Your Free Matrix42 30-Day Trial! Graphical compliance reports can be created directly from the Enterprise Manager Web console or via periodic emails. This allows IT and business staff to report on relevant SCCM infor- mation without any SCCM or SQL know-how. In just 5 clicks, the Service Desk or any other IT representa- tive can distribute software, operating systems, patches and scripts with no technical training. Real-time, user- friendly graphical progress information allows instant troubleshooting and remediation. 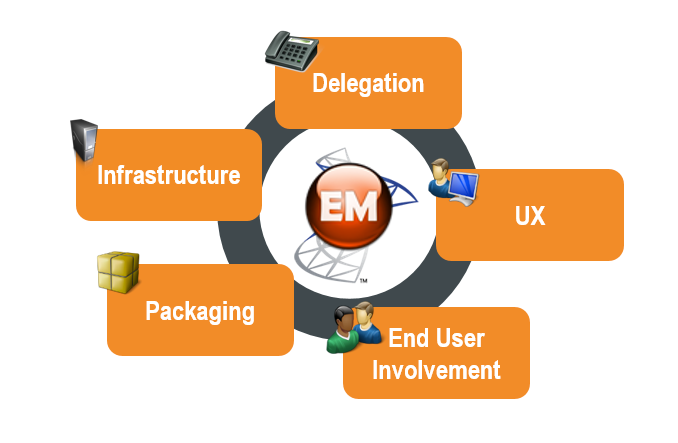 Improved end user communication – user self-scheduling with no loss of control! Users are provided with clear, comprehensive information on tasks that will affect their workspace and when they need to be carried out. They can schedule the task around their work for minimum disruption, and are also made aware of things they need to do to make the process run smoothly, such as closing an application before running the task. The result: less work and fewer headaches for IT staff as well as greater user satisfaction with IT. By providing role-specific access to functionality around packages & patches, computer groups and scripts, senior IT professionals can hand over simple tasks to less expert colleagues without giving them access to the SCCM console. The following charts illustrates the difference between a "normal" delegation from the System Center Configuration Manager. A substantial disadvantage in this scenario is that the SCCM administrator is solely responsible for the distribution of software or packages or permissions. The Matrix42 Enterprise Manager simplifies the delegation from a central location. The administrator has the possibility to delegate specific tasks and functions to employees. This may include the release of requested software products as well as the provisioning of installation tasks. 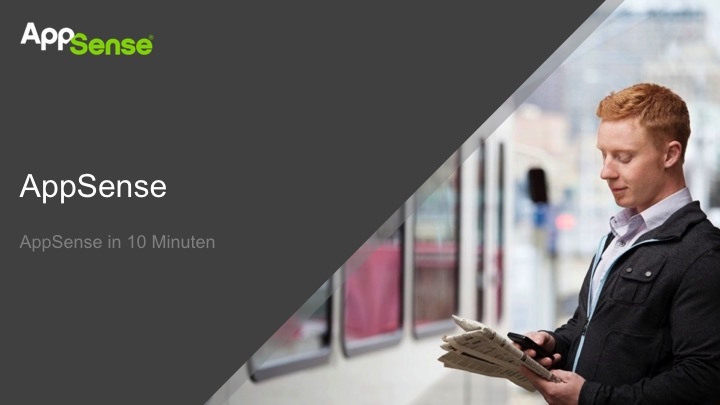 For a quick overview we recommend the video with David König, product manager of Enterprise Manager, at the 4th Meeting of VCNRW in Cologne. Benefit from many years of experience in implementing complex Microsoft SCCM environments and virtualized infrastructures (VDI). Do you want full automation of your system landscape, OS deployment and application provisioning combined with automated Incident handling? Then you are right with us. We believe that a good automated infrastructure offers significant advantages over every other environment or solution. Today's technological possibilities in regards to hybrid cloud infrastructures and improved management tools for the operation of such infrastructures offer high potential in savings of operational costs. Today it is easier then ever to take this route. Benefit from our data center experience. End-to-End-Monitoring with System Center Operations Manager. Windows PowerShell is today and in the future the way to full automation of your IT environment. Based on .NET it enables IT administrators to adjust any settings in their environment. It can be used to fully automate your entire IT system landscape. Why Profile management with PowerShell? We at RISC use the Windows PowerShell for the control and configuration of the user's session. The advantage lies in the dynamic extension of the functional scope and the seamless integration into any Windows environment. This way you control whether certain settings are set for your users - or vice versa - are to be deleted. The PowerShell Profile Management takes care of your printers, drives, session variables and can be extended with whatever function you can imagine being implemented with Windows PowerShell. We created a simple GUI that can be used by administrators without particular PowerShell knowledge. You don´t need PowerShell expert knowledge to be able to take advantage of what PowerShell can do for you and your users. Everybody can now use the Power of PowerShell. Have a look at our teaser. It should give you a quick look at what you can expect from it. uberAgent is a Splunk agent for Windows. It does not just collect data – it gives you the information that matters. uberAgent tells you everything you need to know about physical PCs, virtual desktops, Citrix XenApp or VMware Horizon View without affecting your systems’ user density. Whether it’s SBC, VDI or RDS: uberAgent covers it all. uberAgent stands out from the crowd because it is not another me-too product, but gives administrators the information they actually need to improve user experience. uberAgent’s high-quality metrics include detailed logon duration and application launch performance, to name just two. But that is not all: uberAgent is built on a powerful platform, Splunk, which makes it possible to enrich uberAgent’s data with information from arbitrary other sources (think filers, firewalls, anything) and generate true operational intelligence. Application performance as perceived by end users is crucial for user experience. With uberAgent you can measure it! Application UI latency tells you how long it takes applications to react to user input. One of the biggest problems in troubleshooting IT systems is the lack of correlation. It is easy to examine a single machine, but it is very difficult to examine dozens or hundreds of computers. uberAgent changes that. 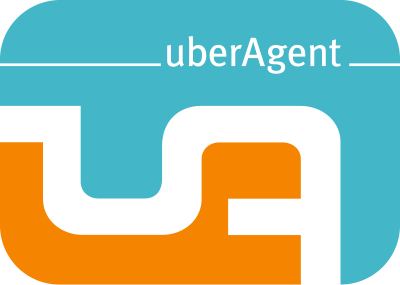 uberAgent helps you find correlations: is a single user/machine affected or many? IT operations involves keeping an eye on a huge number of different systems and ensuring all of them run smoothly. Want to know more? Response times per machine, per application and even per session. Even more? Logon duration, group policy processing and user profile loading duration in great detail. uberAgent’s data collecting component is a lightweight agent that can be run without the need for a locally installed Universal Forwarder. A typical footprint of less than 20 MB RAM, less than 0.3% CPU and no disk IO at all (with diagnostic logging turned off) makes it truly unobtrusive on the monitored endpoints. uberAgent does not rely on Windows performance counters but comes with its own metrics. Instead of raw data it gives you information that matters. A list of metrics can be found here. The agent is highly configurable: metrics can be turned on or off, the data collection frequency can be chosen freely and information from irrelevant sources can be filtered out. This ensures that only data you really need is sent to Splunk for indexing. Do you have any questions aroun uberAgent or Splunk? We are happy to help you with any of them. Unidesk layering innovation provides all of the capabilities needed to simplify deployment and management of Windows virtual desktops and applications in one powerful, easy-to-use solution. 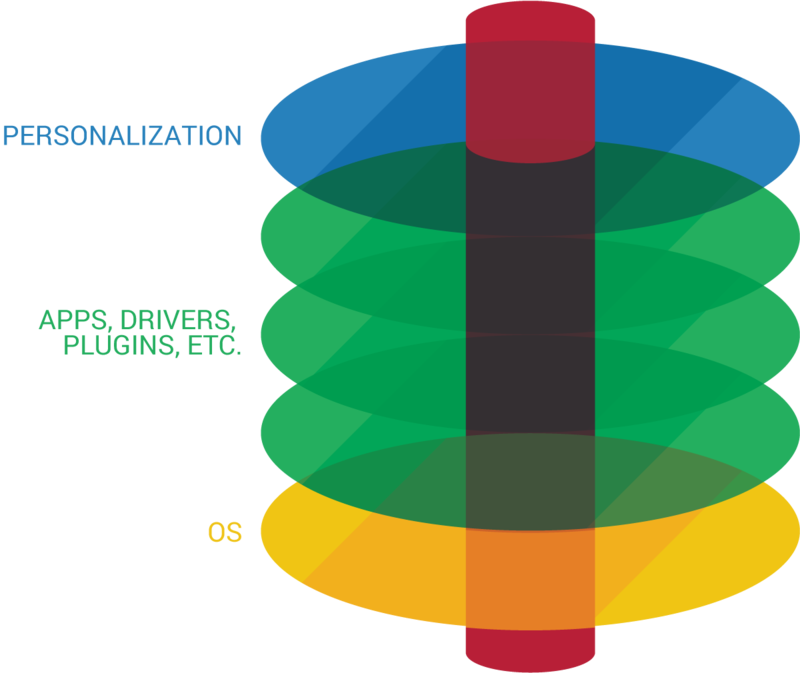 Unidesk Composite VirtualizationTM technology dynamically combines the OS and app layers created and assigned by IT along with each user’s personalization layer. IT can provision, patch, and update all desktops by simply updating a layer once. None of IT’s changes affect the local pro le settings, user- installed applications, and data in the personalization layer. Because Unidesk operates between the hypervisor and Microsoft Windows, anything can be a layer, including the OS itself, system services, and kernel-mode apps. There is only one Windows and application instance that needs to be patched and updated. Layers can be updated centrally , without affecting the other layers. The same file system is used by many desktops. This leads to lower storage space requirements. Complete personalization with simultaneous use of user-installed applications. Persistent and NonPpersistent Desktops are serviced by the same layer. You do not need more then one console for desktop provisioning, image management, application delivery and personalization. This leads to a reduction in the administrative complexity. Unidesk Elastic Layering dynamically attaches apps and personalization at logon to pooled non-persistent desktops and remote desktop session host (RDSH) sessions based on user policy. Both resource-efficient desktop types, which can be shared by many users, will the same look and feel as resource-intensive persistent desktops, which require a dedicated machine for every user. Elastic Layers are ideal for delivering apps without the downtime of rebooting session hosts or virtual desktops. They’re also a great way to conserve datacenter resources by allowing shared sessions and non-persistent VDI to be personalized. One reason VDI is sometimes chosen over traditional Server Based Computing (SBC) is to give every user a personal desktop experience. Unidesk leverages container technology to give SBC users their own unique apps and personalized workspaces within a shared Citrix XenApp or Microsoft RemoteApp/RDSH session. Unidesk Session Containers enable Elastic Layers to be dynamically attached at logon and run isolated from other user sessions. User-installed apps and profile settings will also persist between logons. For the first time, SBC can offer the same personal user experience as physical PCs or persistent VDI, with greater resource efficiency. It’s not only about delivering apps. It’s also about undoing that last Windows hot fix that affected the 40 users in Accounting. And reversing the update to the EMR system that took down the hospital’s patient check-in kiosks. And knowing how many licenses of your speech dictation software have been allocated. Unidesk provides the lifecycle management capabilities that make it easy to manage your Windows apps from deployment to retirement and everything in between. Back-patching the OS and reverting apps to their previous versions to avoid costly downtime is now just a few clicks away. No matter what type of workspace you deliver - virtual desktops or shared sessions - end users won’t be happy with anything less than full personalization. That’s why our layering technology goes beyond apps to make you look like a hero. Our writable persistent layer saves all of your users’ profile settings, user-installed apps, and plug-ins. By providing a consistent user experience every time your users login, you’ll boost productivity. Not to mention IT’s status. 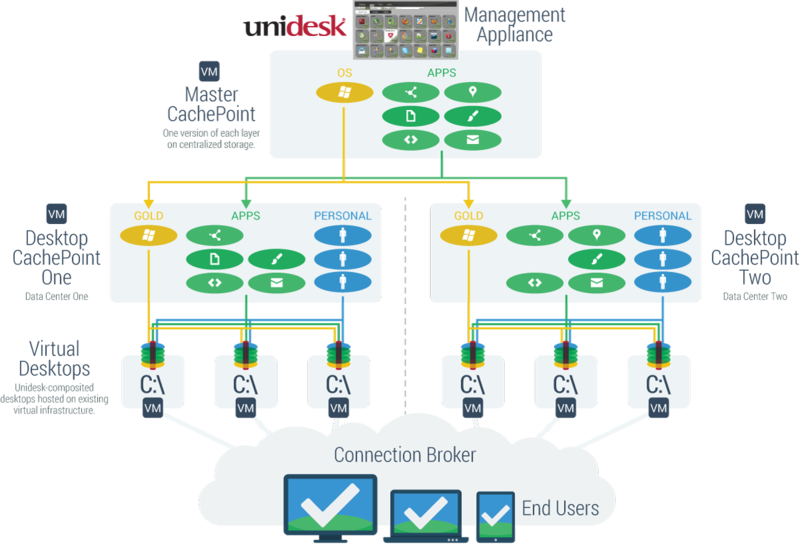 Unidesk consists of an appliance that acts as a Master Cache Point. Additional Cache Points are used to scale the Unidesk environment . For questions about the required infrastructure, technical details or licensing use our contact form. We're here to help. As a VMware Consulting and Integration partner we offer extensive experience in the implementation of the VMware data center portfolio. Benefit from our many years of experience in virtualizing complex Citrix XenApp and XenDesktop environments. Through our Remote Desktop Services experience you can also benefit from VDI implementations. You want to make Windows applications available on a Mac? With VMware Fusion Professional 8 you can seamlessly run Windows apps on your Mac. You are looking for an alternative to Citrix XenApp? Take a look at Horizon 7.